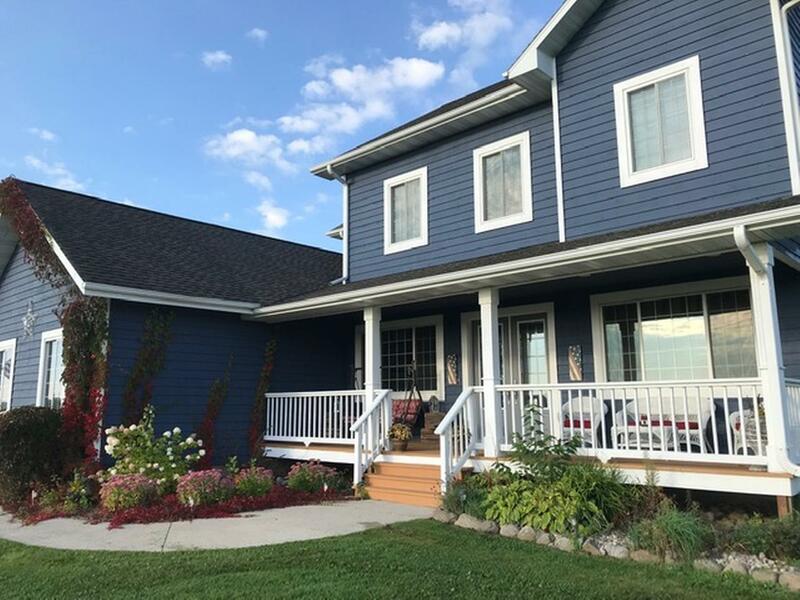 This amazing 4 bedroom/3.5 bthrm home has 10&apos; ceilings, LED recessed lighting throughout (including on the 2 covered porches), 2 car heated garage w/sink, sits on 2 acres & has a 30x50 outbuilding that has a 14x50 lean to!Many updates have been done in the past 4 years including a newly blacktopped drive & all new appliances (included) &apos;15, new forced air furnace with WIFI thermostat &apos;17, & a 75 gal water heater in &apos;18.The entire house has been freshly painted inside & out, as well as having a lot of newer flooring installed over the past few years.Main floor consists of open concept kitchen/den with gas fireplace, dining room, living room, laundry, 1/2 bath, & guest suite w/ full bath. 2nd fl has full bath, 3 lrg bdrms w/ the master boasting of being 16x20 with his/her closets, & beautiful bathroom featuring tub, walk in shower, dbl sink, & separate toilet area. Lrg rec rm in basement plmbed for wet bar, theater room & Bthrm w/shower installed (toilet/sink need to be hooked up).